Plym was a small, steam-powered tug built in 1903 by Willoughby Brothers of Plymouth, Devon. She had an overall length of 50’, a beam of 10’, and her twin cylinder engine enabled her to make 8 knots. During the Boxing Day Sports meeting of 1908, which was held on the green at Whalebone Cove, Plym was in attendance “to convey ladies, small children and the infirm, and made two trips from the East Jetty at 9am and 9.45 respectively”. On November 12th, 1912, together with the tug Samson she was called to the aid of the stricken mail and passenger ship Oravia which had run onto the Billy Rock. In 1929 when she was converted to a lighter. Today, rather fittingly, the skeletal remains of this little tug lie beached at the northern end of Whalebone Cove. Philomel was a motor fishing vessel built by J G Forbes & Company of Sandhaven, Aberdeenshire in 1945. She had an overall length of 75.5’, a beam of 19’ and a 7.75’ draught. Her hull was framed in oak and clad with larch. She was powered by a 140hp Blackstone Lister diesel engine and could carry around 40 tons of cargo. The vessel was purchased by the Falkland Islands Government and arrived in the Falklands on February 11th, 1948 at a total cost of around £14500. She was operated as a coastal supply ship around the islands until being replaced in 1966 by mv Forrest. 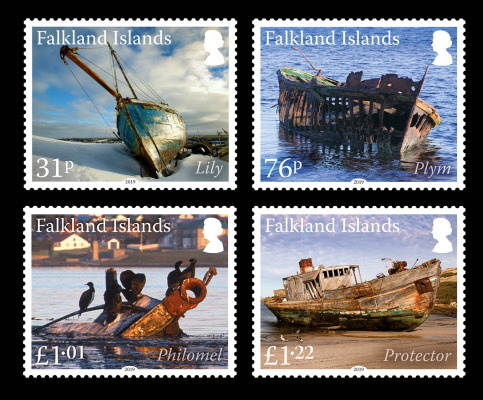 The Falkland Islands Monthly Review of 4th September 1967 noted “This little vessel has served the Colony well and camp people will, we are sure, miss her welcome calls with cargo and mails.” Philomel was sold to Mr Freddie Jones. In February 1969, “Cracker” Jack Davis borrowed her to tow the Protector 3 around to New Island. On July 2nd 1971 Philomel caught fire while at anchor off the FIC west jetty. She was towed by the tug Lively, to her final resting place at Fairy Cove where she continued to burn until Sunday 4th, becoming a total loss. Possibly built in the early 1870s, Lily arrived in 1886 onboard the Selembria as one of a pair of raft boats. The other was later converted into the Saxon. Bob Cull converted the Lily into a cutter for the Duncan family on Beaver Island. During the 1970’s she was owned by the Falkland Islands’ Government dentist, Robert Watson, who sailed her to West Falkland one winter to tend the dental needs of the residents of West Falkland. Onboard Lily was the famous Dentist’s Chair which is now on display in the Stanley Museum. The current owner, Zachary Stephenson, was the last of many owners to sail her and today, after over a century afloat, she lies beached at the Canache, at the eastern end of Stanley Harbour. A minesweeper built in Nova Scotia in 1943, The 163-ton Protector (full name Protector III) arrived in Britain too late to sweep mines after World War 2. She was briefly employed in the East Anglian shell fishery before, in 1949, she heading south to the Falklands as part of a Falkland Islands Government-backed sea lion hunting project at Albemarle on West Falkland. A lack of seals condemned the enterprise to failure after just 3 seasons. Thereafter, she sporadically ran cargo around the islands, especially livestock and mutton carcasses. Eventually she became the property of Jack Davis who, in 1969, towed her around to his home at New Island, where he intended to “do her up”. Alas, before the year was out, Jack had passed away. To this day, Protector remains on the beach in Tigre Harbour where he left her. In March 1986 the old ship was called upon for one last special duty when Mike Goodwin and Sandy Ward were married on the afterdeck and champagned on the bridge. The bride was given away by the late Bob Ferguson who 4 decades earlier had sailed aboard her as an able seaman. Text by Tony Chater with special thanks to Tansy Bishop, National Archivist at the Jane Cameron National Archives, and to Ken Halliday and Zachary Stephenson.